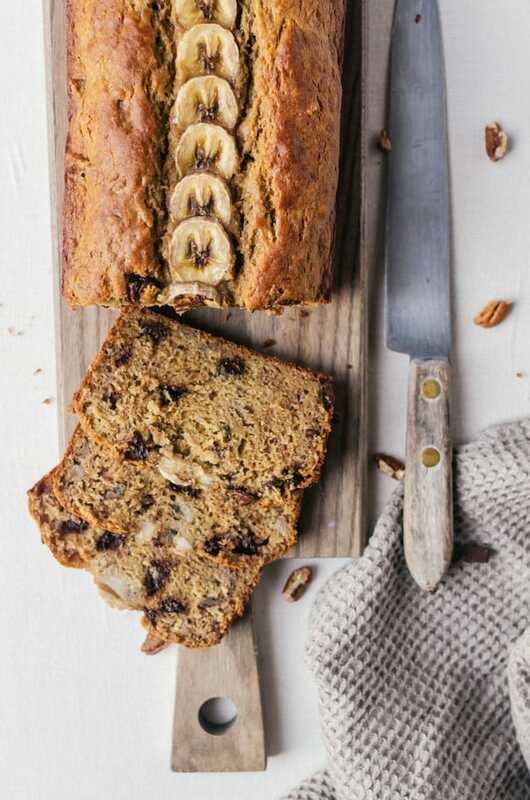 A deliciously moist healthy banana bread made with whole wheat and no butter. 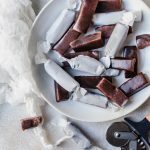 It is refined sugar free and perfect for breakfast or a midday snack! Hi, my friends! It’s been a long time, I know, but I took a much needed break from posting to rejuvenate myself for the next 12 months. I need to know, how was the holiday season for you? Did you set any resolutions for the year? I don’t typically do resolutions and instead try to focus on a word for the year. I still don’t have a word picked out yet, but I am trying to be a more organized person. So far, I am failing miserably with keeping on the schedule I set out. On the other hand, the schedule I created does put me well ahead of where I normally would be so it is still helpful. I know most people have resolutions to eat healthier, or at least slow things down a bit after all the holiday parties and pounds of cookies we’ve all been eating. Things tend to get a little harder with keeping on track with those healthy food goals around this time, so I thought I would start the year by sharing something a little healthier and still freaking delicious to help us out. Here, I bring you healthy banana bread. Everyone has a different definition of healthy. This is healthy for me. 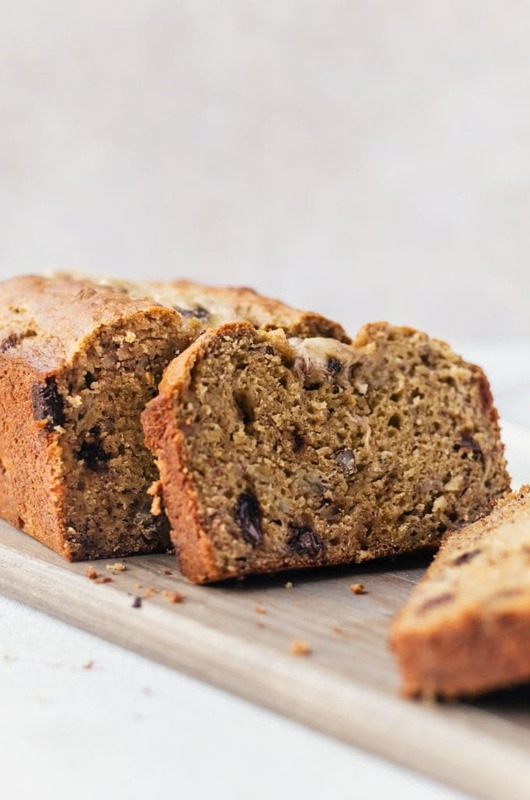 It’s a lot lighter and better for you than most banana breads out there. It isn’t a cake in disguise and packed with butter and sugar. Instead most of the sweetness comes from the roasted bananas with just a little bit of help from pure maple syrup. The butter is replaced with coconut oil. It’s super moist, but still light and fluffy. 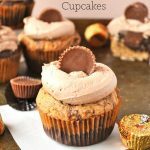 There are chocolate chips and roasted pecans for a bit more flavor and texture. We skip the all-purpose flour in favor of whole wheat. I do use eggs in this recipe, but I’ve also had luck in substituting them with flax eggs. 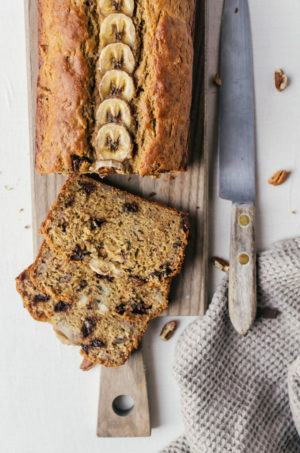 I’ve wanted to share this healthy banana bread for a while. It’s been on my mind since my daughter started kindergarten and I wanted to make a banana bread muffin that I could feel good about putting in her lunchbox and again later in the day as a snack. My original banana bread muffins were a great start with oat flour, reduced, sugar, and no butter, but I knew I could do better. This banana bread is all that I hoped for and more. Plus no one believes me when I tell them that it is secretly better for you. 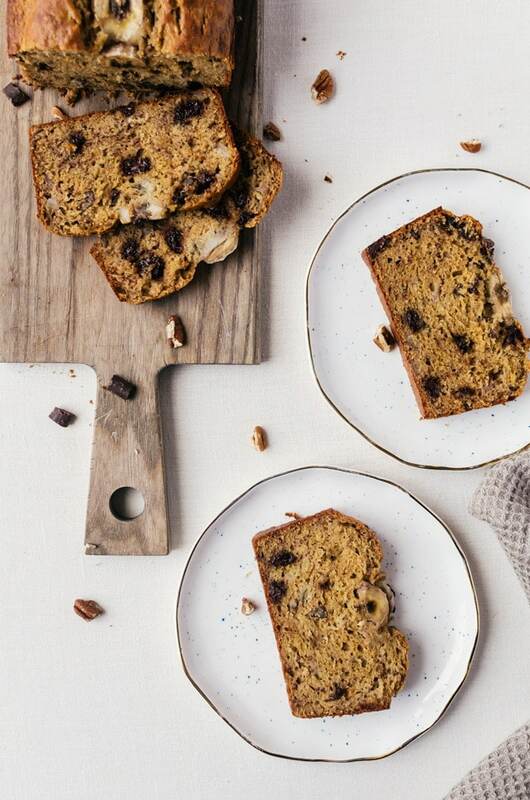 Regardless of your resolutions, there is no denying that this healthy banana bread is e.v.e.r.y.t.h.i.n.g. My expert advice? Make two loafs and store one in an airtight container in the freezer for later snacking. Preheat the oven to 350 degrees F grease 9 x 5 loaf pan. In a medium bowl mix together the flour, baking soda, baking powder, and salt together. In a separate bowl mash the bananas and eggs together until they are a smooth consistency. Mix in the maple syrup, yogurt, oil, and vanilla. Mix until well combined. In a small bowl, mix together the pecans and chocolate chips (* to keep the recipe refined sugar free, I used specialty chocolate chips from Food 52), plus about a tablespoon of flour. Mix together until the nuts and chocolate are evenly coated. Create a well in the bowl with the flour and pour in the wet ingredients. Mix together until there are no dry spots, but there are still a few lumps. Fold in the pecans and chocolate. Pour the batter into the loaf pan and create a line of sliced banana along the length of the middle of the pan. Bake for about 55 - 60 minutes, or until a toothpick inserted in the middle comes out clean. Cool for about 20 minutes, then run a knife between the loaf and the pan, then remove the loaf. Allow to cool completely on a wire rack. 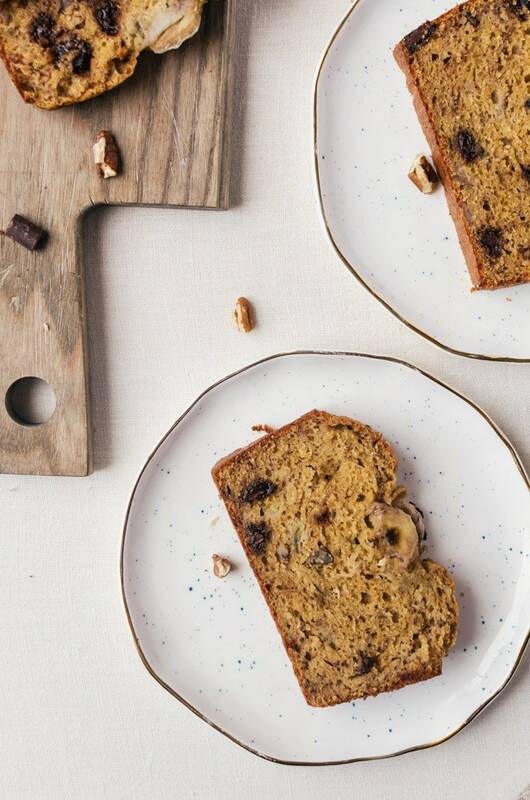 Oh my gosh, this is probably the prettiest banana bread I’ve ever seen! LOVE the roasted bananas on top, (and the chocolate chips of course)! Bonus that it’s better for you! Yes, I feel like people get so up in arms about their own perceptions of what healthy is. I think it is something that is on a case by case basis on what works for you. 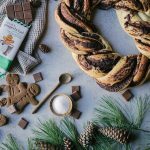 This bread isn’t healthy for someone with celiac disease or gluten sensitivities, but it works for me as much as paleo works for someone else. No one is more right than the other. We are all just trying to do what we can to feel good about what we put in our bodies and get through in life. Thank you for stopping by! I love the slices of banana on top! I’m all for healthier recipes to start the year off!